Introducing New Treatment Tools at Kaizo Health! At Kaizo Health, we’re lucky to get our hands on new products – sometimes even before they hit the market! Our Clinical Research Institute, Kaizo CRI, partners with some of the top product development companies for their research and data collection. So when a new piece of equipment is in the works, we’re the first to know! Check out some of the new equipment we have in our clinics! The NormaTec is a compression device that speeds up recovery and improves outcomes. 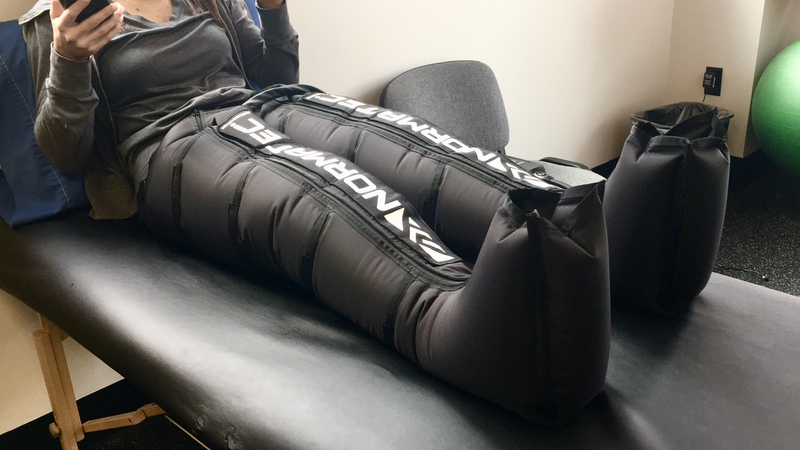 We use the NormaTec on legs, arms, or hips to rejuvenate muscle tissue and reduce tightness and soreness. The Lymphatouch enhances rehab using negative pressure treatment. It improves joint functionality and helps with swelling and scarring, fascial tightness, muscle recovery and pain. The Cubii is a compact elliptical that we use in rehab for people with knee, hip, and ankle pain to rehabilitate and maintain motion. Movement is medicine! The VibraCool is a vibrational cryotherapy tool that instantly relives pain! Ice decreases pain and inflammation, while decreasing blood flow to stiffen muscles. Adding vibrational massage improves blood flow, enhancing the removal of lactic acid, reduces pain and loosens stiff muscles. Are you in pain or feel like you could use a tune-up? Come See Us!